Goffe’s Falls is a neighborhood on the southern edge of the east side of Manchester. Goffe’s Falls is a mainly commercial neighborhood that includes much of Goffs Falls Road and Brown Avenue. Goffe’s Falls is bordered by Interstate 293 to the north, railroad tracks to the east, Pine Island Pond to the southeast, and the Merrimack River to the west. Originally named “Goffe’s Mills” after local resident Colonel John Goffe, the area was also home to Pine Island Park which was one of the most popular recreation areas in Manchester in the early 20th century. Pine Island Park was connected to other areas of the city by a prewar streetcar line. Passengers could travel by trolley from City Hall to Pine Island Park in 18 minutes. From 1902 to about 1950, Pine Island Park had a 60-foot Ferris wheel known as the “Honeymoon Express.” A large carousel operated from the late 1920s to about 1960. The park also had a swan pond, small paddle-boats, and a roller-skating rink. 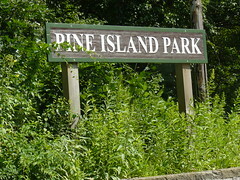 Today, Pine Island Park offers a playground, hiking, and fishing. It was originally designed as a trade show booth from which to distribute samples of Moxie soda. During World War II, pilots flying into Grenier Army Airbase (now Manchester-Boston Regional Airport) were known to have used the 4’ silver-colored cap on top of the Bottle House as a navigational aid. It has since been relocated to the Matthews Museum in Union, Maine as its final resting place.